Acid Midget is undergoing emotional renovations. As a result, there has been a shortage of new street art and new writing on the site. Big things have been happening in the Australian street art community this month. About 12,000 people visited Sydney's Cockatoo Island for the opening week of the Outpost Project. It is the largest street art festival to be held in the southern hemisphere. 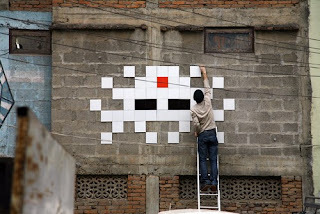 It's a real landmark in the evolution of street art not only in Australia, but globally. You should check it out before it ends on December 11 (it's also free). 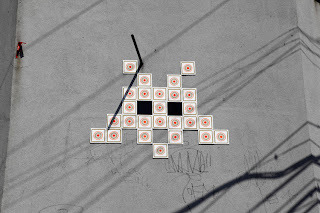 The image above of an Invader mosaic was taken on my last trip to Melbourne. And to think - I thought Melbourne was the street art capital of Australia. I wonder what you guys down there think of Outpost?